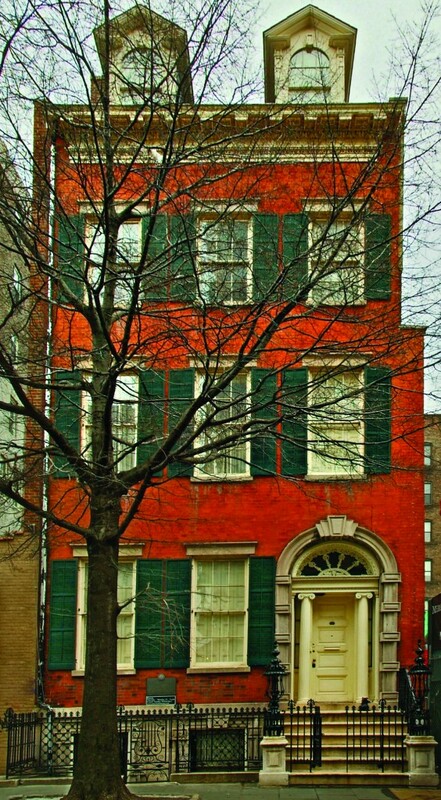 In 1835, the wealthy merchant Seabury Tredwell bought the house on 29 East Fourth Street in New York City. “The elegance and beauty of this section cannot be surpassed in the country,” said the Morning Herald of the neighborhood. Indeed, the wealthiest and most fashionable families in the city chose the Bond Street area as their place of residence, away from Lower Manhattan’s congested streets. Between the 1850s and the turn of the century, the industrialization of America made many Americans money more quickly than they could spend it. In New York, the architects McKim, Meade and White erected magnificent palaces along Fifth Avenue for those who wished to display this wealth. 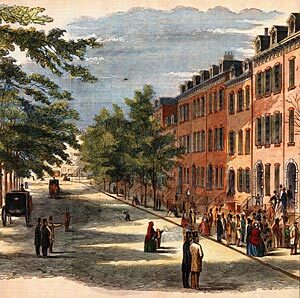 Commerce chased wealth and fashionable residential neighborhoods kept one step ahead of commercial centers in a steady northern migration up the island of Manhattan. 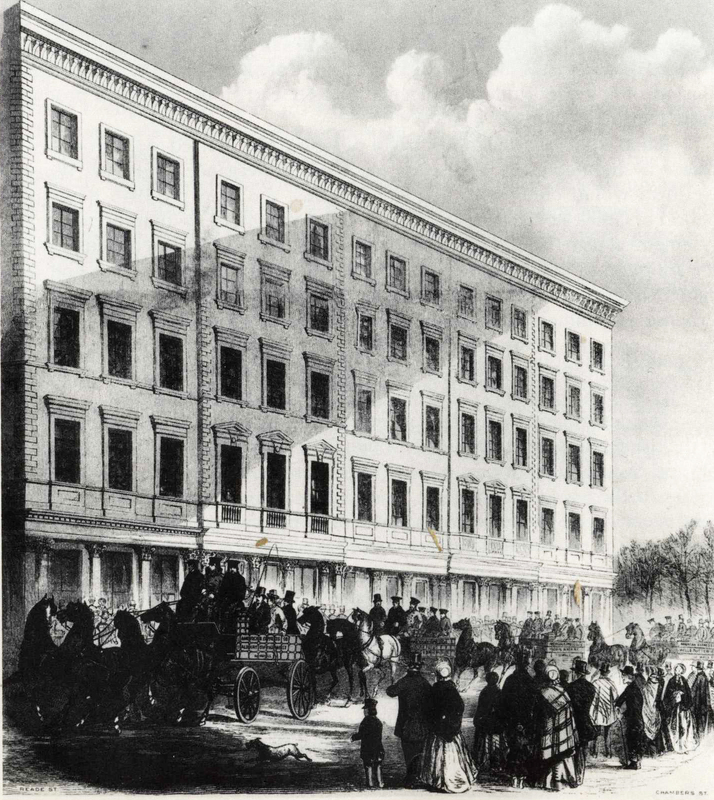 Beginning near Bond Street, commercial palaces were built to replace the residential ones. Eventually, the northern march of commerce reached Union Square. One of the stores to follow this path was Lord & Taylor. 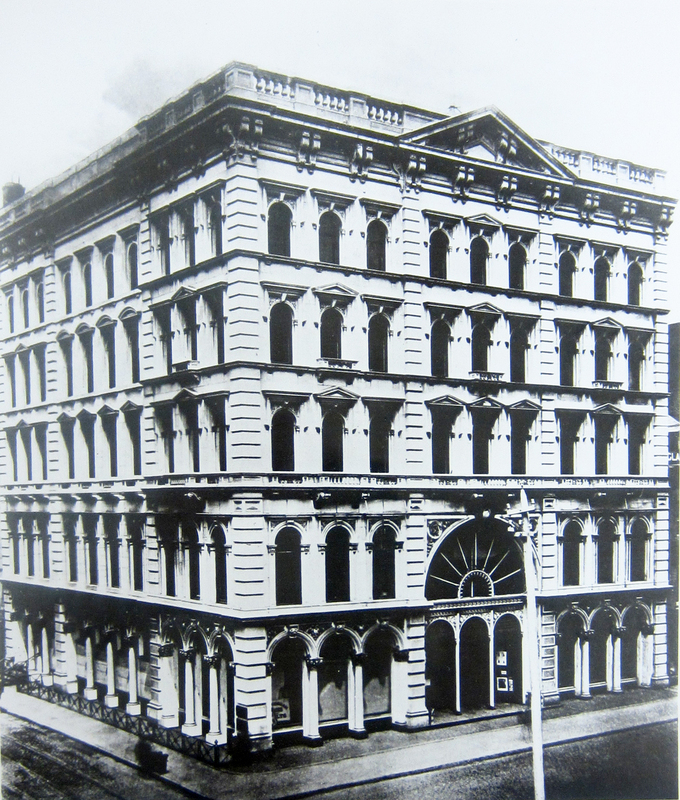 On Monday, November 28th, 1870 the new Lord & Taylor department store at 901 Broadway, opened its doors. 10,000 customers were said to use its elevator in the first three days of operation. The steam elevator, still a novelty in New York City at this time, enabled shoppers to arrive at ease on higher floors, where thanks to the advent of industrialization, more and more merchandise waited for their heart’s content. 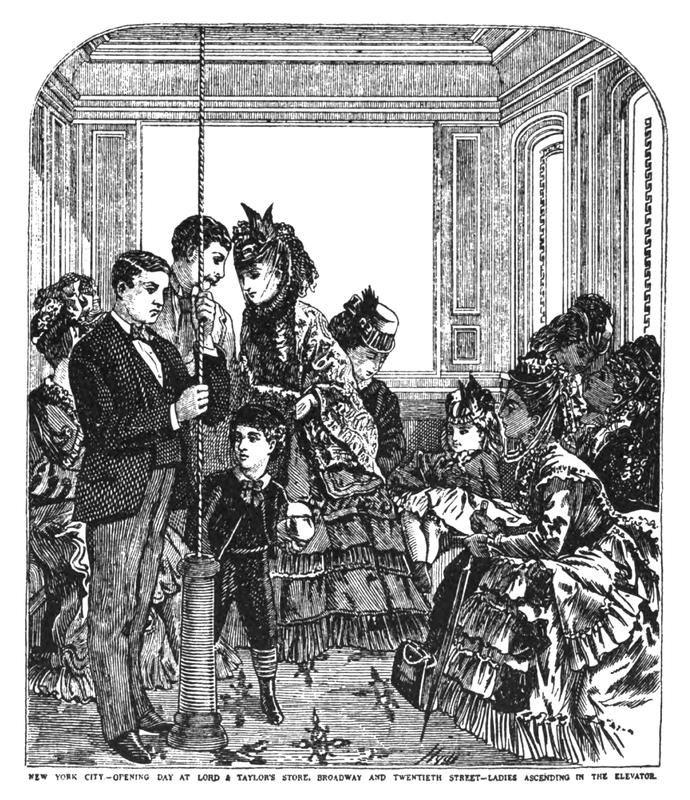 The steam elevator at the new Lord & Taylor store on opening day, November 28th, 1870. By not attempting to imitate the appearance of stone, like some other stores, Lord & Taylor’s new cast-iron façade communicated both innovation and modernization. Lord & Taylor’s history begins in the early decades of the nineteenth century. 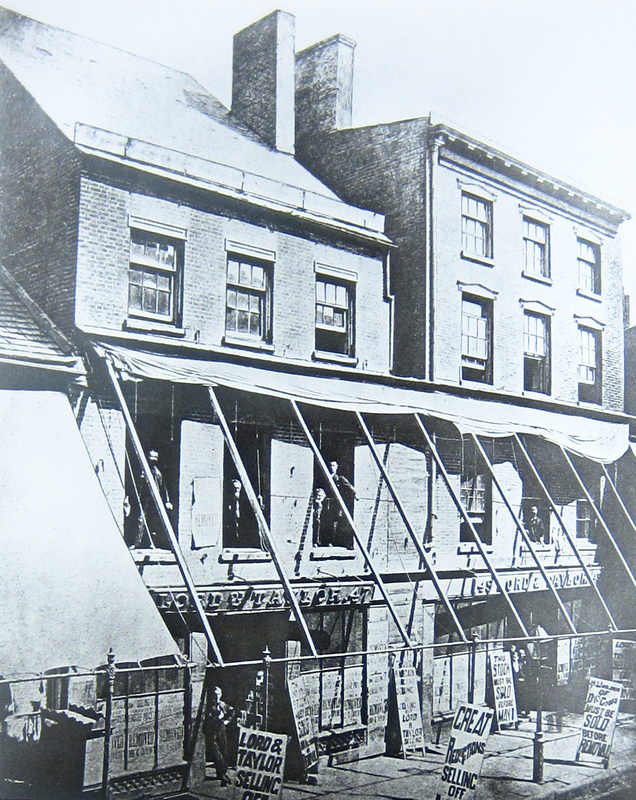 In 1826, with a $1,000 loan from his wife’s uncle, the English immigrant, Samuel Lord opened a dry goods store at 47 Catherine Street. In those days, Lower Manhattan was the center of New York City, and Catherine Street its hub for shopping and socializing. Just a few years earlier, across the street on the corner of Cherry, Henry Sands Brooks opened his men’s clothing store, named at first H. & D.H. Brooks & Co., and later simply Brooks Brothers. Not far from there, on Chambers Street, the twenty two years old Alexander T. Stewart opened his dry goods store in 1823. 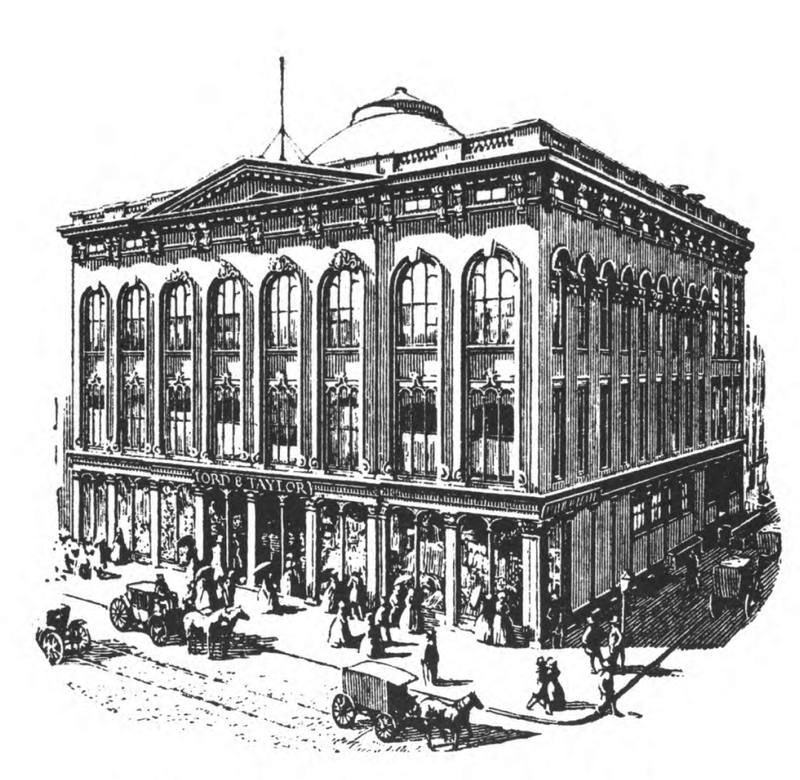 It would later become one of the most successful department stores in New York. 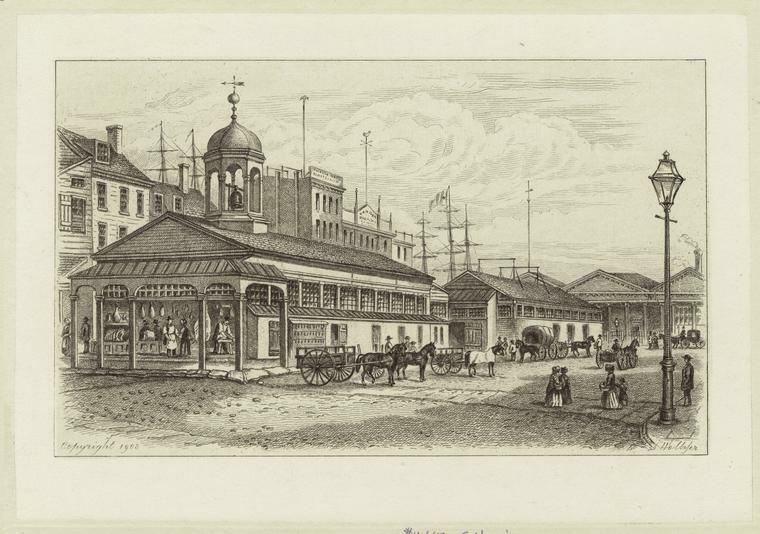 Catherine Street was ideal for commerce because of its proximity to the Catherine Slip and the Brooklyn horse ferry. By the time Lord & Taylor opened their doors, the bustling Catherine Street was already lined with: “furniture shops, shoes shops, tin shops, cloak shops, meat shops, bread shops, candy shops, crockery shops, pawn-brokers shops, sugar shops, hat shops, dry-goods shops, groceries and markets.” These stores hired “pullers-in,” young, tenacious men who aggressively hustled customers in. To distance themselves from the market mentality of the street, Lord & Taylor had a strict no “pullers-in” policy. In addition, prices were not negotiable. In two decades this practice would become a standard for department stores around the world, but in the 1820s and 30s it was quite an innovation. Lord & Taylor was almost an instant success. 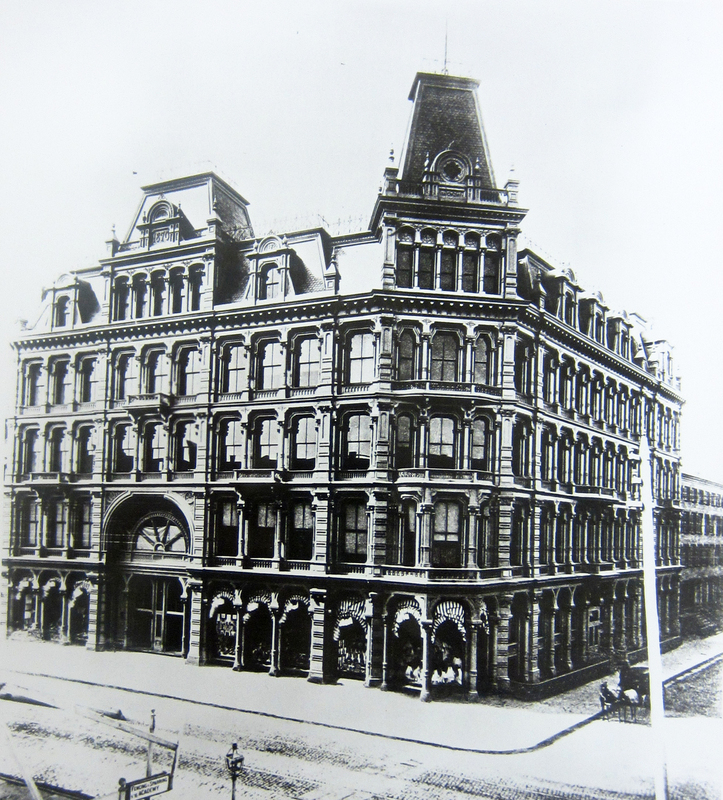 In the next few years it grew rapidly, first expanding to the adjoining building on 49 Catherine Street, and later moving into a four-story building down the street, where shelves were full to capacity with bolts of English fabrics for women’s dresses, and with blankets and linens. The fast-growing population forced the city residential areas to expand north, a trend that must have been felt by Samuel Lord, who, while still on Catherine Street, purchased a coal yard at the corner of Grand and Chrystie Streets. In 1853 he opened the new Lord & Taylor on that site. The building featured the first large glass-domed central rotunda in the city, an innovation that flooded the shopping floor with natural light. Lord & Taylor were among the first dry goods stores to sense not only that the fashionable crowd had started moving uptown, but also that it was looking for a new kind of shopping experience. The Catherine Slips, early 1830s. Special Collections and FIT Archives. 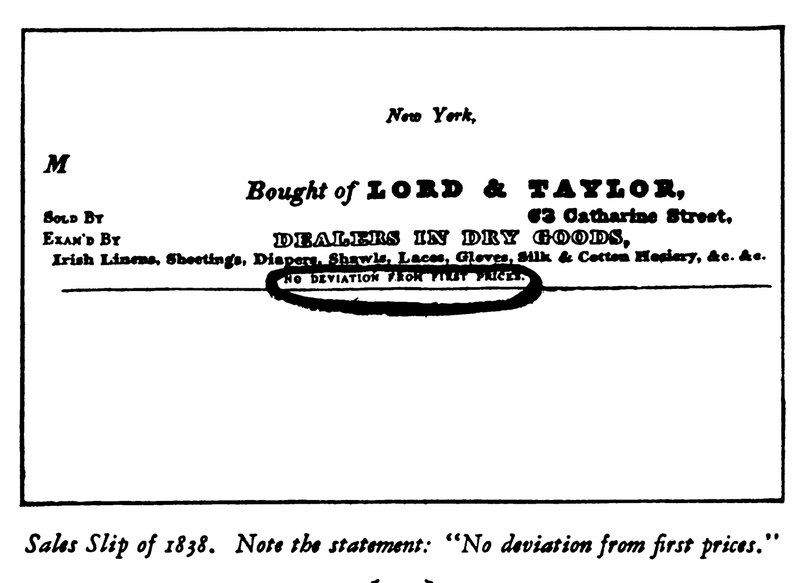 Lord & Taylor Sales Slip, 1838. The History of Lord & Taylor, 1826-1926. Lord and Taylor store at Grand and Chrystie Streets, opened 1853. The History of Lord & Taylor, 1826-1926. Lord and Taylor ‘s second location on Grand Street, corner of Broadway,1860-1874. Special Collections and FIT Archives. The great world fairs, such as London’s Great Exhibition at the Crystal Palace in 1851, and the New York Crystal Palace in 1853, were the stimulus, if not the inspiration, for the growth of dry goods stores into department stores. The display of quantities of goods in a large well-lighted space, in addition to the high ceilings and architecture of iron and glass, simulated the experience of the world fairs, with the advantage of being able to actually purchase the goods. In addition, urbanization, mass transportation, and mass production were key factors to the development of department stores. The Industrial Revolution enabled all of these factors to exist at the same time, reaching a new peak in the mid-nineteenth century. In New York, A.T. Stewart was the most innovative of the bunch, erecting in 1846 a six-story marble building on Broadway at the north side of City Hall Park. The “Marble Palace,” as it was called by New Yorkers, featured plated-glass windows along its façade and was hailed by the Tribune as “a real sensation.” Carriages, transporting customers to and from the store, lined the street, most likely contributing to the already chaotic traffic on Broadway. A.T. Stewart’s Marble Palace, 1851. The New York Historical Society. SPECIAL NOTICE TO THE LADIES – The paving of Grand Street with Belgian pavement is now completed from Broadway as far as the store of the undersigned, and Ladies who have been prevented during the last three months from reaching our store in carriages, are informed that the interruption is now removed. 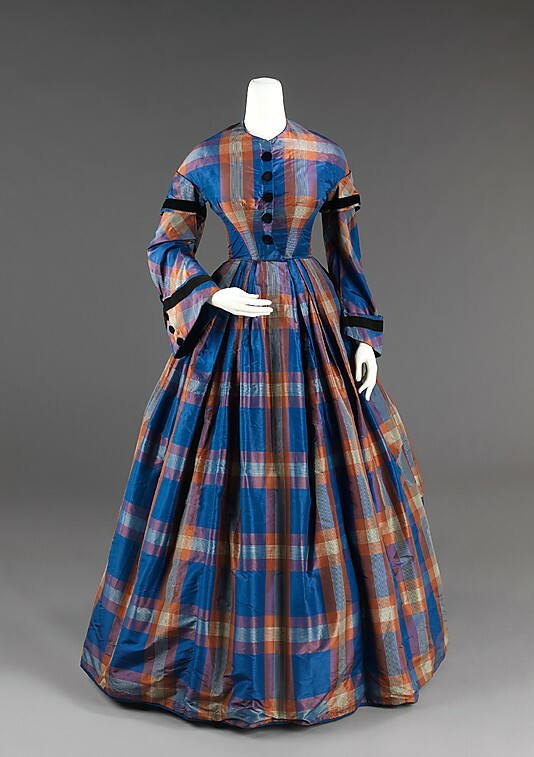 Afternoon dress, ca. 1850-55. The Metropolitan Museum of Art. 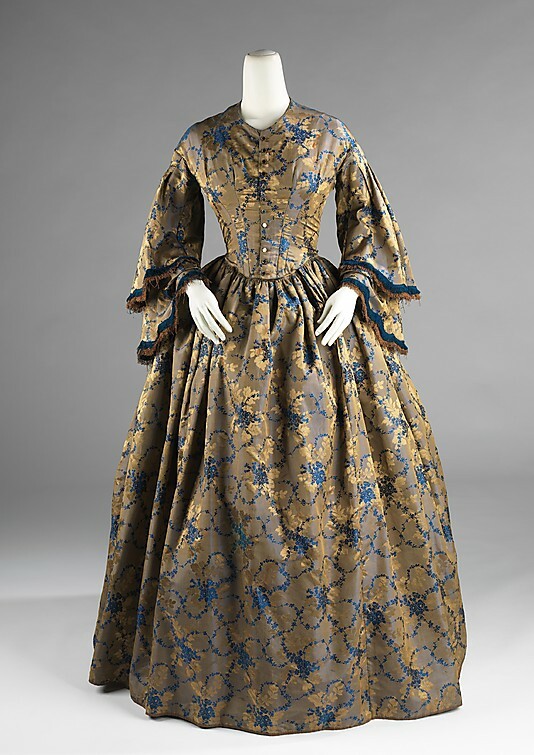 Afternoon dress, ca. 1855. The Metropolitan Museum of Art. 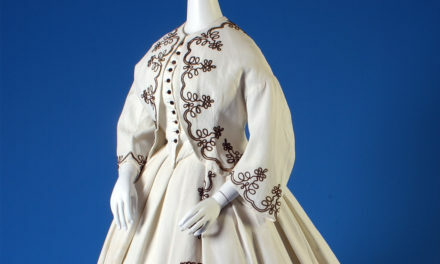 How hard it must have been to board and descend these carriages in the fashions of the 1850s, when several layers of stiff petticoats and a horsehair crinoline were necessary to achieve the fashionable full skirts, reaching sometimes seven yards in circumference. 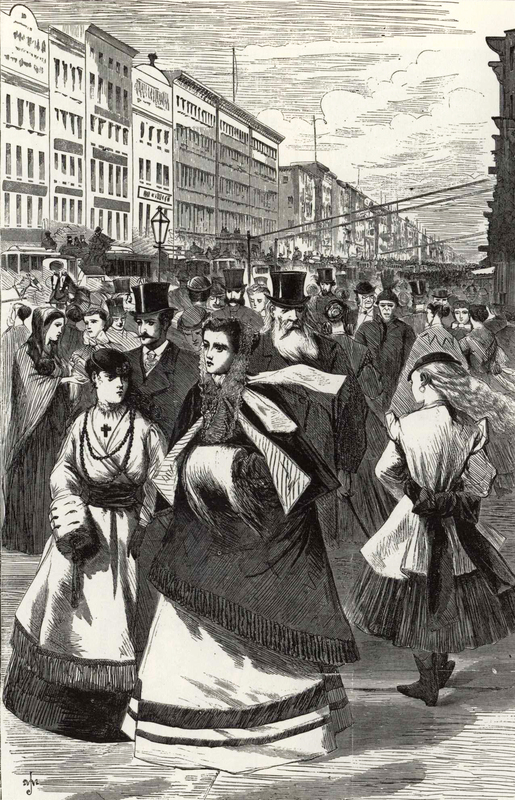 The Lord & Taylor advertisement shows us not only that Grand Street has become an important commercial area, but also that retailers were targeting women shoppers in particular. A.T. Stewart, for example, employed handsome young clerks to “please the ladies.” Spaces like the “Ladies’ Parlor” on the second floor where shoppers could study their appearance in full-length mirrors, offered ideal environment for women to leisurely shop and socialize. 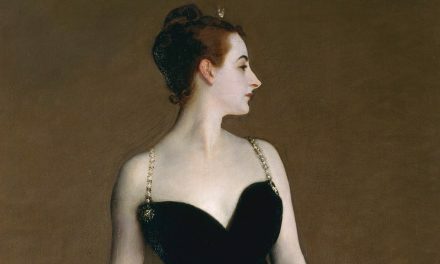 Referring to a young lady of Madison Square, this poem illustrates that wealthy New Yorkers had become obsessed with shopping for luxury goods. One’s clothing, house, furniture and leisure activities determined her social standing. In addition, promenading had also become a symbol of wealth and status. 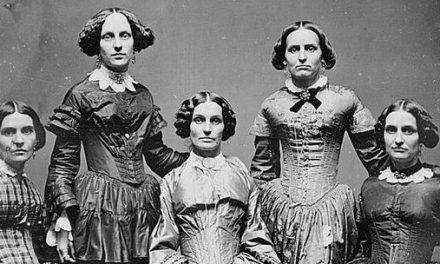 As James Fenimore Cooper noted in a letter to his wife in 1850, New York City is “a great arena for women to show off their fine fathers in.” The industrial revolution provided not only more wealth to more families, but also cheap immigrant labor, which in turn freed mother and daughters to spend more time outside the home in leisure activities. Harper’s Weekly, February 15, 1868. Harper’s Weekly, November 23, 1889. Continue reading Part 2 by clicking here! Birmingham, Nan Tillson. 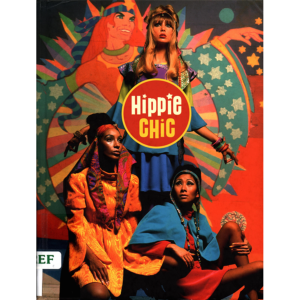 Store: A Memoir of America’s Greatest Department Stores. New York: Putnam, 1978. http://www.worldcat.org/oclc/918392031. Boyer, M. Christine. 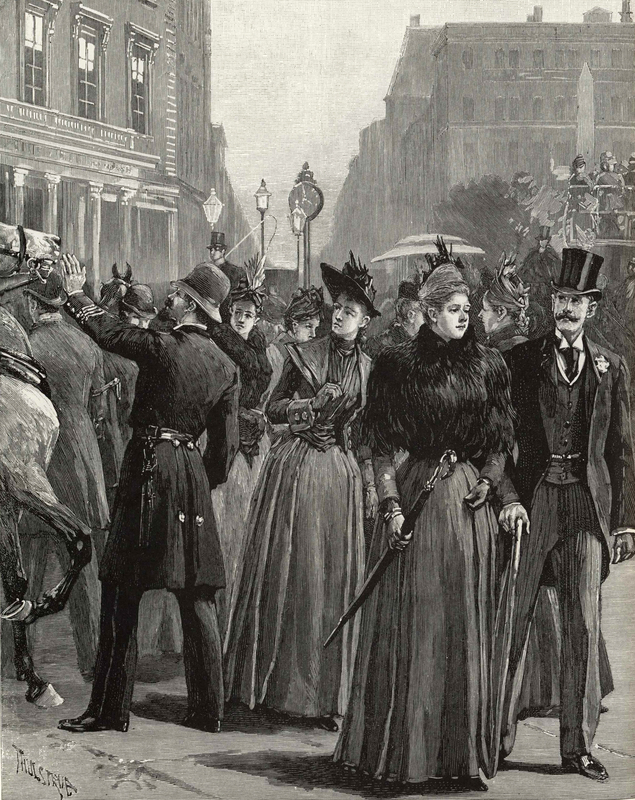 Manhattan Manners: Architecture and Style, 1850-1900. New York: Rizoli, 1985. http://www.worldcat.org/oclc/12344148. Font, Lourdes M., and Trudie Grace. 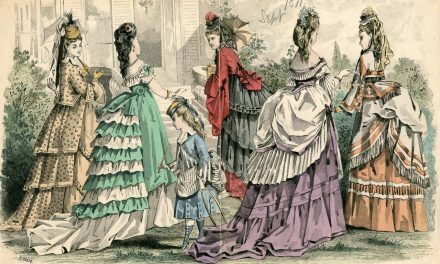 Summer Afternoon: Fashion and Leisure in the Hudson Highlands, 1850-1950. Cold Spring, NY: Putnam History Museum, 2012. http://www.worldcat.org/oclc/827732342. Hendrickson, Robert. The Grand Emporiums: The Illustrated History of America’s Great Department Stores. New York: Stein and Day, 1980. http://www.worldcat.org/oclc/11476450. The History of Lord & Taylor, 1826-1926. New York: [Guinn], 1926. https://catalog.hathitrust.org/Record/101652433. Morris, Lloyd R. Incredible New York: High Life and Low Life from 1850 to 1950, 1996. http://www.worldcat.org/oclc/1024107303. Weisman, Winston. “Commercial Palaces of New York: 1845-1875.” The Art Bulletin 36, no. 4 (1954): 285–302. https://doi.org/10.2307/3047580. Whitaker, Jan. The World of Department Stores. 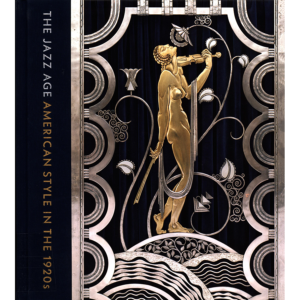 New York: Vendome Press, 2011. http://www.worldcat.org/oclc/818618320. 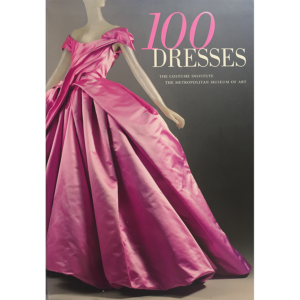 I am a dress historian, curator, and author. 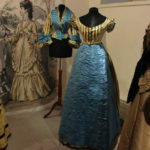 With over a decade of experience as a fashion designer working commercially, I have built a full-rounded knowledge of the contemporary fashion world rooted in historical perspective. 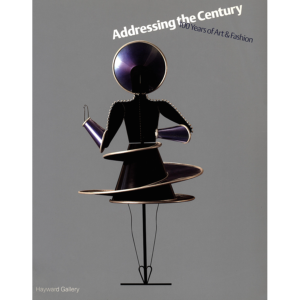 My interests include 19th, 20th, and 21st century fashion; retail history in New York; Gilded Age America; the American photographer Alice Austen; Israeli fashion; and the history of the luxury brand Gottex which was the topic of my MA thesis paper and an exhibition I curated at the Laurie M. Tisch gallery in New York. 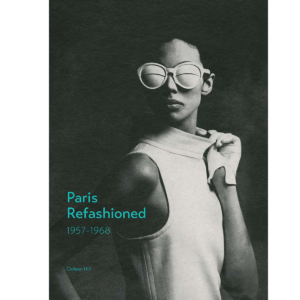 I am continuously expanding my interests; I research and write on fashion and its history, using it as a window to history in a broader social and cultural contexts.